Perfect for snacks, lunches and football fare. A healthy alternative to potato chips. Wash and pat dry the kale. Preheat oven to 350 degrees (325 if using olive oil). 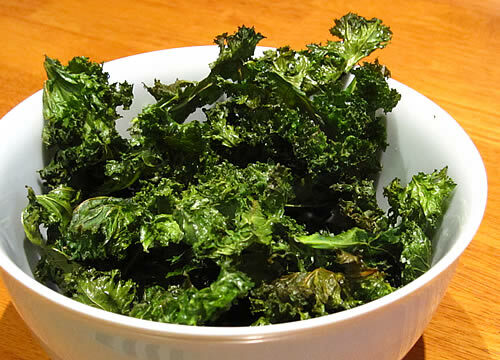 Peel kale leaves away from thick stems and put in a bowl. Add oil, garlic and salt and other seasoning and toss well or massage by hand. Spread out kale on baking sheet. Bake for 10-12 minutes, or until kale is slightly crispy around the edges.